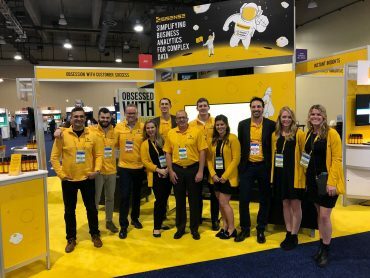 Gartner Data & Analytics Summit 2018 kicked off this week in Grapevine, Texas and my first day on the floor was an exciting one. It’s always great to speak with other data professionals about what’s on their minds for the upcoming year and have meaningful discussions on where the market is going. In the keynote of the day, Scale the Value of Data and Analytics, researchers from Gartner talked about how 11,000 inquiries in the past year unveiled that customers want to scale the value they get out of analytics. How can they do that? Through a fundamental shift happening in the market: BI to AI. In an era where “fake news” has become a regular occurrence and a viable political weapon, people are craving verified information. The same goes for information circling around organizations. The “fake news” in this case though, is “fake data.” Establishing trust in business means a way of verifying data and providing scrutiny through verification. How can we do this? Automation and crowdsourcing. Take, for example, Wikipedia. How did such a distributed, crowdsourced network become so efficient at creating content that is reviewed, accepted, and most importantly trusted, while we struggle to do the same in our enterprises? We can look at Wikipedia as a model for how our processes around metadata need to change. Centralizing metadata doesn’t work anymore. It’s time to throw out the playbook of the ERP era and move to a new playbook that strives for crowdsourcing and automation. McKinsey has shown that companies with diverse leadership are 33% more likely to achieve financial results that outperform the industry average. But this diversity is not just about gender and ethnicity. Organizations also need to promote diversity that you can’t necessarily see. The diversity of behavioral and work styles is critical to business performance and innovation. Allowing employees to work how, where, and when they feel the most comfortable and productive can only benefit your business. And in a global economy and global workforce, these trends are becoming more and more popular. If we take it even deeper though, your algorithms can also be biased. Although not the first thing that comes to your mind, Gartner researchers delivering the keynote made a point that workplace diversity is crucial to increasing the value of analytics and reducing bias in your algorithms. If you’ve read the 2018 Gartner Magic Quadrant for Analytics and Business Intelligence Platforms you’ll already be familiar with Gartner’s two modes of BI. Mode 1 covers well-established production environments while mode 2 refers to agile and innovative, content generating BI. However, as data becomes more and more complex, it has become clear that we need to bridge the gap between these two modes for self-service BI that scales. We need to start applying data initiatives that master this complexity. According to the Gartner keynote, this means embracing a bottom-up approach to BI where small teams of talented data “artisans” build prototypes. A high risk, high-value approach. Getting value out of data comes down to one big factor: end-users’ data literacy. If end-users of dashboards can’t decipher what different charts and graphs are telling them then the proper business action, based on data, can’t be taken. Natural language technologies can greatly help here. For example, let’s say that instead of looking at a stacked area chart, your end-users see a bulleted list of text, produced by Natural Language Processing (NLP) in plain English, that tells them what the most important insights are from their data. As Head of Product at Sisense, it thrills me to know that we’re already allowing our customers to do this with Sisense Narratives. If anything was made clear yesterday at Gartner Grapevine it’s that BI professionals that create change in their organizations by addressing the four challenges above will shift away from manual processes and prevail. As more and more vendors begin basing their strategies on AI this “trend” is starting to become the new standard. By the way, if you’re at Gartner Grapevine this year stop by booth 801 to chat even more about the way AI is changing analytics and see the Sisense enabled bulb in action. If you’re not, don’t worry, keep your eye on the blog for daily updates and takeaways from more Sisensers on the floor.